Valve won't be attending CES 2015, the company's vice president of marketing has confirmed to TechRadar. Instead, Doug Lombardi said Valve is planning a large Steam Machine presence for GDC 2015. Lombardi wouldn't say whether this means other companies besides Valve will be showing off Steam Machines at March's GDC, though it seems likely at least some of the Portal maker's myriad Steam Box partners will have a presence at the annual game dev conference. 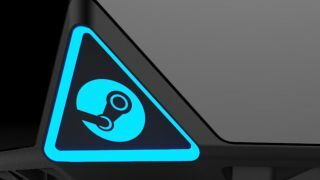 There's still the possibility for Steam Machine makers other than Valve to show off their wares at CES in January, but Valve can be counted out. Steam Machines were arguably the most exciting products to come out of CES 2014. Valve Co-Founder Gabe Newell hosted a press conference at the show to announce more than a dozen companies planning Steam Machines of various specs, prices and sizes, including Alienware, Gigabyte and Maingear. The veritable steam behind the Machines weakened as the year wore on, however. GDC 2014 had nary a Steam Machine, save for a redesigned Steam Controller (which, by the way, is possibly being redesigned again). Then in May, Valve announced in a somewhat weird way it was pushing the "release window" of Steam Machines and the controller from 2014 to 2015. Among the Steam Machine participants, Alienware has been the furthest along. Its Alpha Steam Machine even went up for pre-order in August and is set to begin shipping on November 21. An Alienware spokesman confirmed to TechRadar the Alpha shipping date still holds. Delays and redesigns aside, Valve is clearly gearing up for a big Steam Machine push next year. While it won't be making the trip to Las Vegas in early January, GDC 2015 could serve as the perfect platform for Valve to re-ignite the fire under its PC-gaming-comes-to-the-living-room hardware. TechRadar will be on the ground at both shows, so stay tuned for the latest on Valve and Steam Machines into the New Year.